What is another word for detail? To select for special service. arrangements, data, facts, Inquiries, goods, granularity. retailers, wrinkles, scans, OUTS, particulars. media, data, tail, exactly, attention, granularity, consideration, retailer, precise. outlined, Stipulated, Indicated, Explained, summarized, expanded, Provided, stressed, Mapped, stated, elaborated. outlined, Explained, documented, verified, Accounted, found, elaborated. describes, indicates, identifies, lists, contains, presents, amounts. detailed, particulars, detailing, clarification, clarifications. 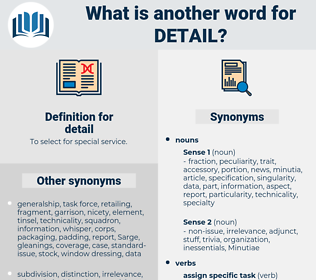 particularity, verbosity, length, detailing, technicality, thoroughness, Disaggregation, specificity, clarification, particular. cover, withhold, suppress, confuse, misrepresent, hide, mix up, simplify, conceal. It is not necessary to discuss these measures in detail. In fact, he gave infinite attention to detail. day lily, dale, death toll, dole, dally, daily, dalo, diddle, do well, doll, dottle, doyly, dahlia, dle, delilah, doily, deadly, dull, duel, dial, dhal, doyley, dill, deli, diol, dowdily, dal, dowel, dalea, dwell, delhi, delay, doodle, Daedal, dl, dawdle, douala, dhole, dahl, daylily, dail, deal, dottily, dell, deathly, duly, dual, dali, dolly, doddle, dol. nooks and crannies, trifle, technicality, nook and cranny, respect, regard, triviality, sticking point, minutia. component part, portion, part, component, constituent. enlarge, flesh out, expound, elaborate, expatiate, expand, lucubrate, exposit, dilate.